My new pup Astro joins Bingo this year for his annual Halloween portrait which is my canine tribute to one of my favorite Saturday morning programs growing up in Philadelphia called Cartoon Corners (aka the Gene London Show). It starred Gene London portraying an artist who lived near a haunted house called Quigley Mansion and had a tremendous influence on my career choice as well as my love of mysteries and the paranormal. His character, among other things, was always solving mysteries, encountering ghosts and finding secret tunnels and hidden passageways. All in all it was the perfect show for someone like me who also devoured Nancy Drew books and loved Scooby Do and Johnny Quest. He was a captivating story teller and would use his drawings to illustrate the tales. He truly made me believe that my dream of becoming an artist was possible, something for which I am forever grateful. I had the opportunity to meet Gene London many years later at a party here in NY and he was so warm and gracious even as I swooned all over him. This year's portrait is dedicated to him and his wonderfully enchanting show. You can see a charming interview with Gene London here. I have noticed a surprising increase in Halloween themed sales in my Etsy shop Curious Portraits over the past few weeks and simply cannot account for it. I am happy to believe however, that the world is simply filled with fellow Halloween enthusiasts like myself who just never get enough! For Bingo's annual Halloween portrait this year I combined my love of Jules Verne and of 1950's sci fi movies in an homage to vintage space travel. I have always loved reading Verne's imaginative descriptions of victorian science, particularly in From Earth to the Moon. I have also spent many Saturday afternoons as a child entranced by 1950's sci fi movies such as The Day the Earth Stood Still, Destination Moon and It Came From Outer Space to mention just a few of the many. I also thought a lunar landscape would be the perfect counterpart to Bingo's deep sea adventure of 2013. I had so much fun combining the deep black of space with the atomic green of the cheesy moon foreground. Let me also make it clear that Bingo was never in any actual danger during the painting of this portrait. Every year around this time I find myself on the lookout for that first little bit of orange at the green grocers, usually in the form of mini pumpkins. Then follow the larger pumpkins and decorative gourds soon after. It truly marks the beginning of autumn which is my favorite time of year. Last year I was wandering through the farmer's market in Fort Greene, Brooklyn and I found a treasure trove of the most beautiful decorative gourds! 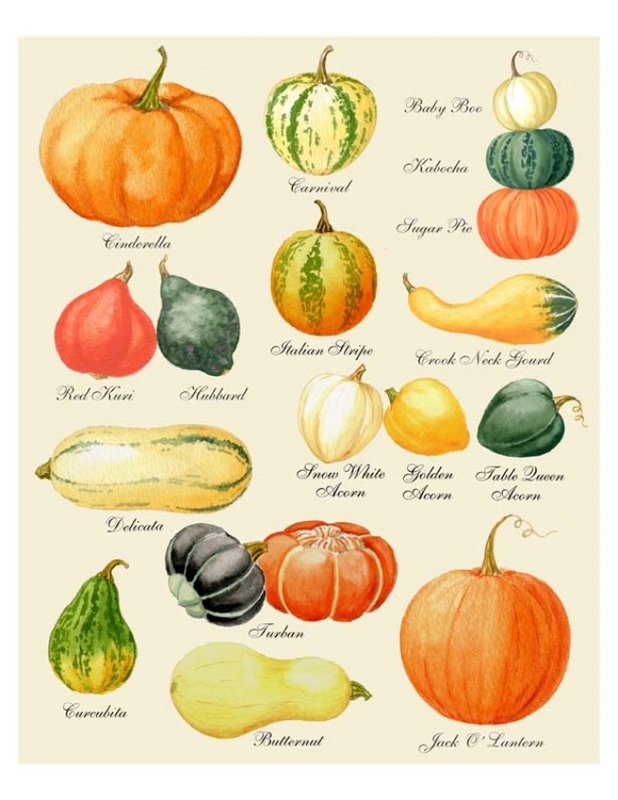 I bought a whole bunch and they inspired me to paint this Pumpkin Varieties Chart to help usher in the season. Just looking at these makes me smell the wood smoke and feel the chill in the air. Soon it will even be time to pull out my vintage Halloween decorations and begin carving a pumpkin. I like to try out different faces each year, usually scary and since it is always so hard to decide upon one, I thought I would do a painting of all sorts of Jack O Lantern faces, some scary and some friendly. I added in a black scroll border complete with crows to finish it off! Both paintings are available as prints in my Etsy shop The Curious Kitchen. I am sorry to be so tardy in putting up my Halloween post but thanks to Hurricane Sandy I was among the powerless here in lower Manhattan and we just got the electricity and internet back today! I think it is safe to post Bingo's annual Halloween portrait without spoiling the surprise now that you all have gotten your cards in the mail! This year poor Bingo is yet again in traveling peril. He is in Edinburgh, one of my favorite cities which happens to have the most remarkably creepy and beautiful victorian graveyard called Greyfriars. Bingo is just beyond the gates consulting his map in search of the statue of the famous dog Greyfriars Bobby which can be seen behind him. I am happy to report that he survived this adventure and is safe and sound here at home! I love this little skeleton in a window on Grove St. So simple yet so menacing. I also thought this sweet little pumpkin on Grove St. made the perfect Halloween statement. This tasteful pumpkin grouping in the window of the Goodwin Restaurant on Hudson St is just beautiful. This display in Garber's Hardware is hilarious. They thankfully had a few fireplace logs left that helped keep me warm-ish during the blackout when we had no heat! I just love this courtyard also on Grove St. They always do something special for the holidays and this year it was just fantastic! This year for my Halloween portrait I chose the subject of one of my favorite poems, Edgar Allan Poe's The Raven. I find such delight each year at this time in reciting Poe's poems out loud. His words just tumble and roll off the tongue. I imagined Poe's raven would be well groomed and dapper as was the style of the day and portrayed him as such. Yesterday I walked down to Spring St. and 6th Ave. to see how the preparations for the Greenwich Village Halloween Parade were coming along. I look forward to it every year and the whole neighborhood comes alive. There were so many creepy and wonderful puppets and costumes so I took tons of photos. Happy Halloween! As far as I am concerned the week before Halloween is the best of the year! I thought I would celebrate the people in my neighborhood (Manhattan's West Village) who get into the spirit of Halloween as much as I do! The above photo is in my living room, I just love the old ornaments from the 40's and 50's. These 3 are from Rag & Bones on Christopher St. Some spooky votive candle holders my dear friend LJ sent me! I began this portrait in sepia tones as I do most of my paintings and liked it so much I decided to finish it without adding color. I think it gives it a spooky and old fashioned look and reminds me of my Halloween portraits of my dog Bingo. I'll be selling prints of it in my Etsy shop Curious Portraits beginning this weekend. Now that it is September I am already looking forward to Halloween, my favorite time of year. I've been making good use of that resin skull I purchased last year by incorporating it into some new paintings. The first one I finished is a still life. The second which is still in progress, alas, does not have the skull but features a disembodied hand that usually sits on my hearth and a vintage doll head. The third is so far an underpainting and has the whole skeleton holding his own head in his hand; a theme I used successfully with my dog Bingo in his "Sleepy Hollow" halloween card a few years back. Here are the latest installment in the 1920's german figure-inspired portraits. A pair of black goblin cats. This time of year is so inspiring to me; the oranges and greens, the spooky images. I just can't get enough of it. Well, it's my favorite time of year again and I've been busy putting up all my vintage Halloween decorations from the 40's and 50's. Over the past few years I've been spending too much time on E-Bay trying to buy up all the decorations that I remember having as a child and I think I am nearly there. (I am waiting to hear about a Skeleton Pirate and an Owl Pirate that will complete a set of 4 of which I already have the Witch and Cat). After that I am cutting myself off as I simply have no more wall space in my tiny apartment! I just love them though, all those odd color combinations of orange and dark green. They fill me with warm memories of childhood and excitement about Halloween approaching. Last year I began a series of Pumpkin Man portraits inspired by these images and I thought it was appropriate to share them this week. They were in fact the inspiration for my Bubble-Head men!